"Ah, you are new hear. What is your name? ", said a woman with a clipboard. Clearing my throat, I said, "Hi. My name is Scott, and I have teak decks." "Hi Scott", the others droned. I was not encouraged by the lack luster greeting. I was feeling nervous, not sure if I made the right decision. The non-skid decks group was meeting next door, and I had gone between the doors of both rooms, looking in, trying to figure out which one to enter, many, many times. Sensing my doubt, the woman said "Scott, don't worry. You, and these people before you, are an affirmation that we are not all crazy for keeping our teak! In fact, without your ernest dedication, I might find mysefl a little... hungry." Wait what?? And with that she began to transform into a beast, a hideous hag. She stretch her impossibly long arms out towards me, grabbing with her varnish stained hands, barnacles on her knuckles. "Come! ", she cried, fingers grasping around my neck. "Give me your fingernails! Give me your wallet!" "Scott, wake up! You are having a nightmare! ", said Kristen, shaking me awake. 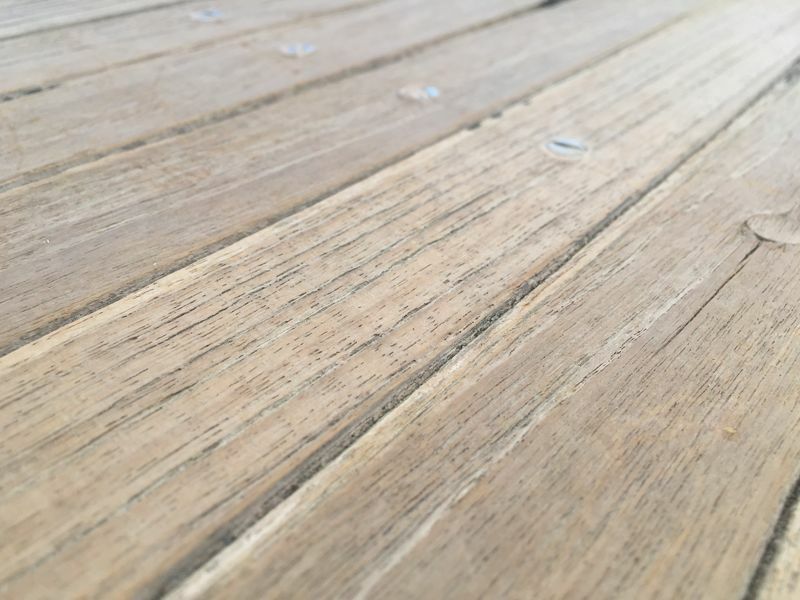 "Of course we do still have teak decks." Kristen and I have been debating about what to do with the teak decks on our boat. They need help. About twenty five percent of the caulk has been coming out of the seams, mostly in high traffic areas like the side decks and at the mast where I work my reefing magic. The planks are in good shape, fortunately. They started life at twelve millimeters thick, not too much, not too little. Now, thirty five years later, they vary from eleven to seven and a half millimeters, depending upon where you measure. 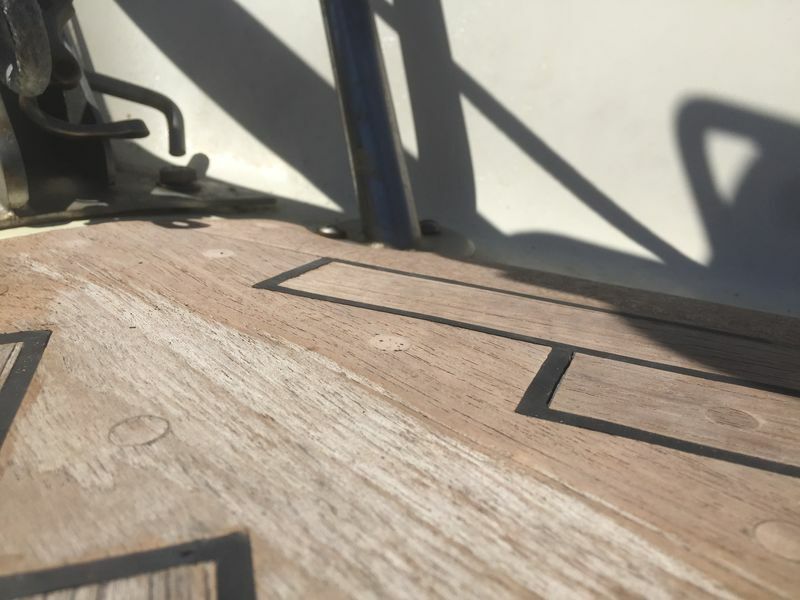 Wauquiez glued their decks down, using screws to hold them in place. The glue is good, and we have no leaks that we are aware of, despite the lack of caulk. 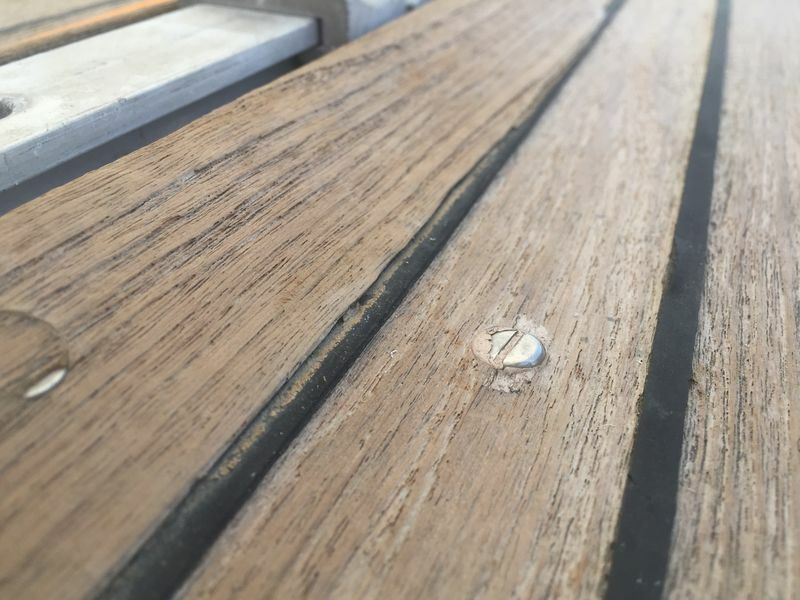 Here you can see some of the caulk separating from the teak, especially lower left. This portion of the deck is right by the mast, where we often work. As the boat is heeled over and bouncing around, we dig in hard with our feet. With proud caulk because of worn planks, that abuse just roles the caulk right out off the grooves. At the bow of the boat, we cut the proud caulk and lightly sanded it down flush with the boards. Even with caulk that we thought was good, we could see it slightly pulling off the edges of the planks after this light refinishing. All of the caulk has to go. 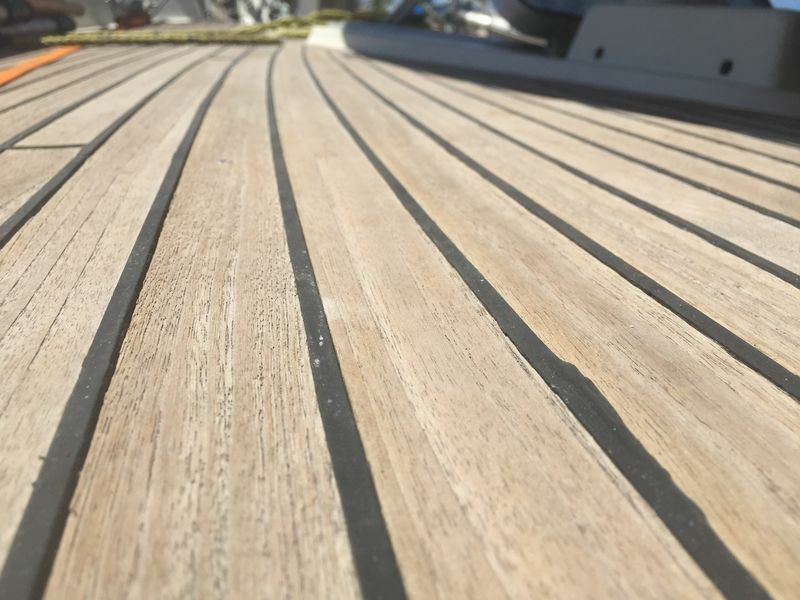 For weeks and months we have wondered what to do, refinish the teak, or rip it all up and paint the deck with non-skid. Two little devils have been on my shoulders, one telling me to keep it, the other to get rid of it. Logically we would get rid of it, eliminating future maintenance and potential leaks. And surely the teak boards won't last another thirty five years. Non-skid paint wouldn't either, but it is pretty damn easy to put new paint down. We spoke with many, many people about what to do, and basically got what we expected, varying opinions. Bastards, all of ya! There was a day last week where literally every hour we would change our minds, convincing ourselves the current decision was the right one. Then I'd wash some dishes, Kristen would take a shower, one of us would present an alternate view and flip flop we were sold on the other method. Finally it came down to what was in our hearts. Just like we bought Mango, it wasn't a decision of logic, it was a decision about what felt right for us, and we just couldn't let go of the teak. Not now. If the boards were cracking and cupped, splitting and wearing thin, then sure, it would have been time to put the teak to rest. But it isn't that time yet, there is still life left in the decks. So with a flick of the finger, the non-skid devil went flying, the teak devil smirked and smiled, and before my very eyes transformed into an angel smelling of fresh saw dust and seawater.